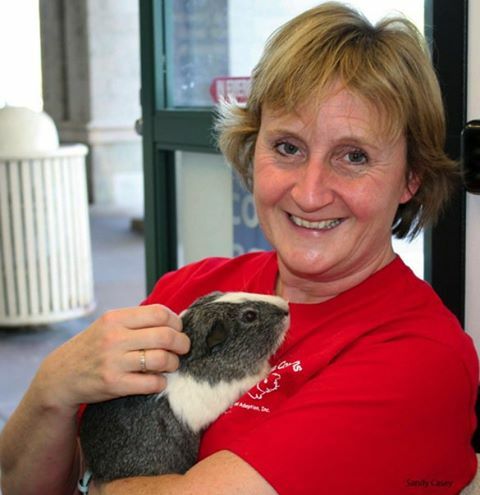 In July 2011, volunteer Debbie called me and said, "Hey, the petsitter has just found a rat in a dirty cage in front of our President’s house." That's how it all started. While our president was out of the country, someone dropped off a rat in a filthy cage, just like that. No note, nothing, just left in the driveway. The petsitter was doing animal care while Fenella was away, and at first thought the dirty cage was dropped off as a donation. Moving it to put it in the cleaning area, she saw something moving inside. Someone abandoned their rat, cage and all! She contacted Debbie right away, and the dedicated volunteer that Debbie is, she immediately drove 30 miles to pick up the dirty cage with a rat. She called me and said, "Antonella, this is one angry boy." Oh, c'mon, how bad can he be, right? Debbie cautiously cared for him, having him examined and neutered by the vet, and after a few weeks, he made his way to my house. Little did I know what I was getting into! Oh wow! By now he had a name: Phoenix. Debbie chose that name because he was rising from his former life to begin anew in Wee Companions. Not only did he look like a wild rat, he also behaved like one. The moment anyone would approach the cage, he would thrash and slam himself against the bars, huffing and puffing, trying to bite us. Fate had it that the weekend after he came in, I got a really bad cold and was bundled up in blankets and my Snuggie. It was a Saturday morning, and I was totally out of energy to deal with Phoenix's shenanigans. I placed the cage on the couch, opened it up, and told him that he could bite all he wanted - I was protected by my blankets and was not going anywhere. Sure enough, he lunged and hung onto the blanket, angry and puffing, yet something in his scared eyes told me that we had to find a way to get along. “What happened to you, Phoenix? Why are you so scared? Where did you come from? Who brought you to us?” These are questions we ask ourselves in rescue and many times, we won't ever have the answers. We move on, knowing that their past is behind them, and we look forward to a bright future, filled with understanding and love. By Sunday evening, something had clicked in Phoenix's brain. Out of the blue, just like that, Phoenix climbed into my lap. He licked my hand, and completely relaxed in my arms. Never again did he threaten me. Never again did he use his teeth in defense, because he knew he was home. Every day, Phoenix would come out of his big cage to hang out on the couch. One day, he was strolling around the living room. What? Where did you come from, Phoenix? How did you get off the couch? Phoenix decided he had graduated from couch time and it was time to break free. He chewed a tennis ball-sized hole into our designer couch so he could comfortably climb through the sleeper couch part to get down on the floor. I thought I was smart to stuff the hole with 4 tennis balls, but Phoenix outsmarted me. He would pick up one ball at a time, place it by the edge of the couch and even push it off! We are not sure if that was a ruse to make us slip and fall or if it was innocently done, but he surely learned fast that this would get him off the couch and his people would give him attention. It felt like we had a toddler in the house! We couldn't go on like this, so he won and we gave him our bedroom. A double Critter Nation cage (his bed at night) and free roam of our bedroom during the day. Phoenix owned every inch of the bedroom and for the next almost 2 years, he was the best boy we could have ever asked for. Leary of people he didn't know, antisocial with rats, but the best boy ever! Fast forward to September 2013. I'm looking at my Phoenix sleeping in his half Critter Nation cage. Age has caught up with our boy and his body is failing him. Each time I look at his eyes, I see nothing but sweetness and goodness in him. Each time I see a tennis ball, I chuckle inside thinking back to our couch fights and me stuffing tennis balls into the couch while he proudly pranced off with one in his mouth. The moral of this story? If you have a "biter" on hand, simply get a whole bunch of blankets for your own protection and do nothing else but love on them and show them patience and understanding. You might have someone as wonderful as Phoenix right in front of you, waiting to rise from the ashes. That's a very sweet story. Thank you! This post made me cry...in a good way, of course. All of you WC ladies are angels. Awww -- what an amazing story Fenella! Thank you for sharing. This one made me cry! Thesr blogs are awesome.